Scott and Melissa Good Taste have been working, working working! The heat in Ojai certainly has arrived so we have been busting a move to try to get it all done as cool as possible. We have been giving a lot of cutting lessons to new riders so it has been fun watching them grow into talented cow cutters! What has me the most excited is our upcoming trip back to Fort Worth for the NCHA Summer Spectacular. And when I think of Fort Worth, I think of... Flying Fish! Our last trip in March we went so many times I couldn't even post all the reviews... 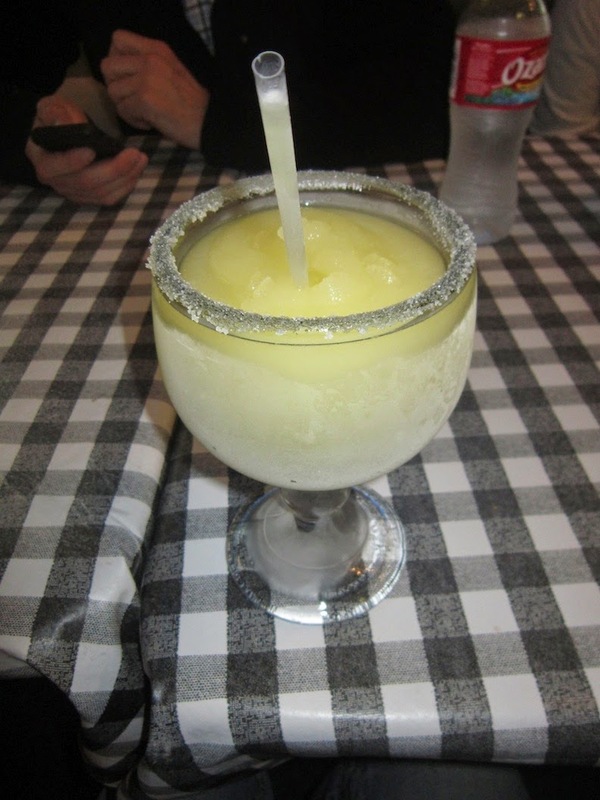 I did try the advertised "Frozen Margarita" on one of our trips there. It was so large, I did not even make a dent in the frozen fish bowl. It was very satisfying though, I loved the slush! The Jambalaya caught my brother's eye on the men and it was sure something when delivered to the table. The sausage, shrimp, okra and rice bathed in all that sauce made the bread worth dipping. It is fun to order things that we don't normally see on the menu at our regular places. I cannot resist the Gumbo at Flying Fish, even if I get the cup size it fills my craving for it. My eyes are always larger than my stomach and I usually never finish my entire meal but I do make an effort that is for sure! This trip in addition to the Gumbo, I also got crazy and ordered the Fried Shrimp and Oysters. It was great! Too much, but delicious. The fries are fantastic and fun to share with the table. That is how I make friends! Scott and Cowboy Ron always, always get the Tilapia Tacos and screech, "MAKE IT SNAPPY!" when they place the order. What in the heck does that mean you wonder? In Flying Fish Land that means make it spicy. They love the grilled fish, creamy coleslaw and pico de gallo on the crispy taco. The beans they serve with them are simmered low and slow in beer. It doesn't get much better than that! If you are on a health kick and want to take it easy in the calorie department you too can dine at Flying Fish. Grilled Tilapia, zucchini and summer squash make for a very nice lunch. They serve the platter with the special beans but you can ignore them if you want to concentrate on low carbohydrating it. Just dose that bad boy with lemon and hot sauce and you will be one happy camper. So on this Happy 4th of July I would encourage you all to appreciate the united States of America and give back, rather than take! Have respect for our veterans and those who continue serve to protect us. God Bless the Red, White and Blue... Amen.